In January of 2013, did you watch Bullet Catcher run down Route 1 in Maryland, followed closely by jockey Abel Castellano, tracking the horse in his car? A few months later, did you observe Spicer Cub’s terrifying trip (above), en route to finishing second at Pimlico? Did you ever look for a free race replay from a Maryland track, happy to discover that every single one is available on YouTube? If you did, you have Mike Gathagan to thank. 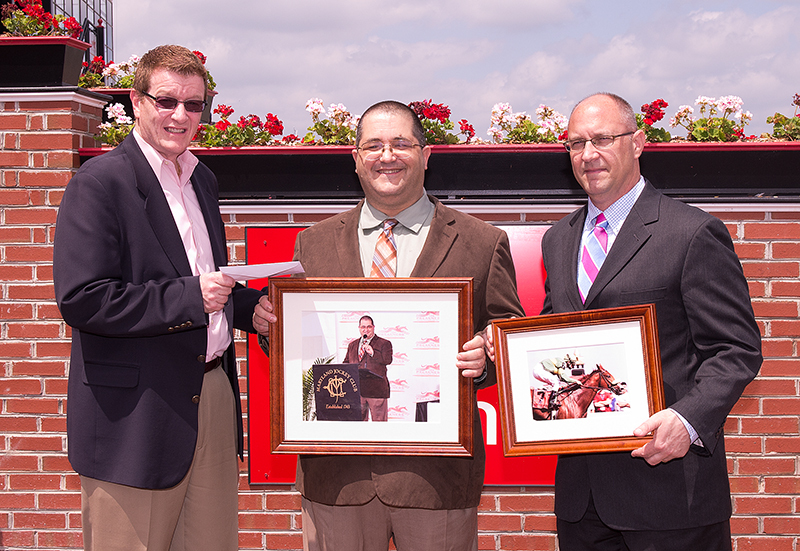 Gathagan (right) and former Maryland Jockey Club president Tom Chuckas present Frank Carulli with parting gifts. Photo by Jim McCue, Maryland Jockey Club.